Amazing Flame is here to answer your questions and get your fireplace working like new. Can't find the answer to your question? 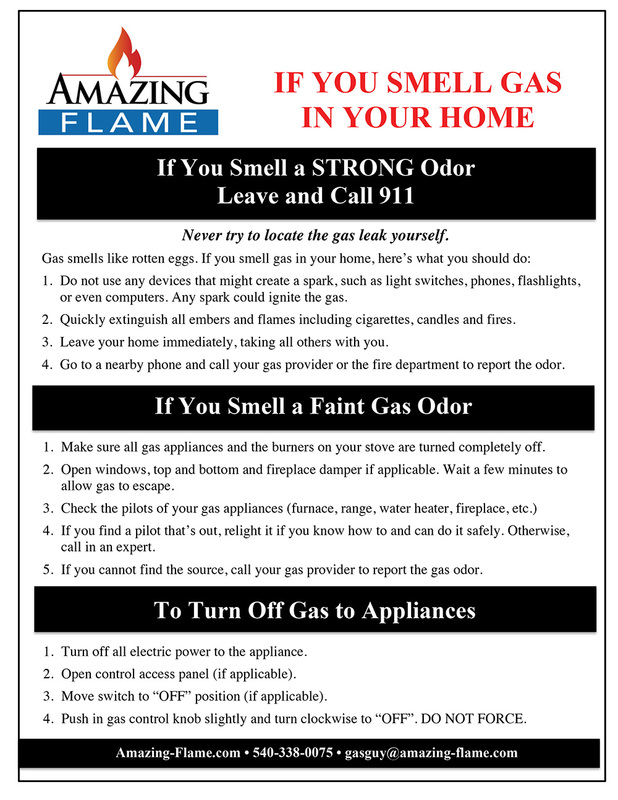 Feel free to contact us at 540-338-0075 or gasguy@amazing-flame.com. Different fireplaces and log sets may use different procedures to light the pilot. It is always preferable to follow the instructions found in the installation documents that came with your appliance or the metal tag or plate that should be attached to your appliance near the gas valve. If there is no instruction manual or plate available, you should be able to light the pilot following these instructions below. To light the pilot on your gas fireplace, locate the main control knob on the gas valve. The control knob will have settings for "On," "Pilot" and "Off." Turn the gas valve to "Off", wait five minutes for all gas to disperse. Turn the knob to “Pilot.” With one hand, press and hold the knob “in,” (a small amount of gas will begin to flow from the pilot barrel). With the other hand press the igniter button or hold a lit match to the pilot barrel. The pilot gas should ignite. If the pilot does not ignite within five seconds, stop and wait five more seconds for any gas to dissipate, and then repeat the prior step. If the pilot does not ignite after three attempts, call Amazing Flame for professional technical assistance. After lighting the pilot, continue to hold the valve control knob in for 30 seconds so the thermocouple heats up properly. Release the control knob; it should “pop” out, and the pilot should stay on. If the pilot does not stay on, repeat the previous steps. If the pilot does not remain lit after three attempts, call for an appointment. To run the fireplace, turn the valve to "On." On some appliances, this may be all that is needed for the burner to ignite, while other appliances use a wall switch, rocker switch or remote control to turn on the burner at this point. Will my gas fireplace work during a power outage? Yes. Most gas fireplaces operate from a millivolt “standing pilot” system and do not require electricity to operate. The pilot light generally stays on 24/7. Some newer units operate with an electronic ignition system (IPI), and do require electricity to ignite, but generally come with a “battery back-up” module that will allow the unit to operate in a power outage. Why won’t the pilot stay lit after extended downtime? It's not unusual to have to make several attempts at lighting the pilot light on a gas fireplace the first time it's used or if the gas had been turned off because air may have accumulated in the lines. Also, it is not uncommon for spiders to build an egg nest in the pilot and/or burner orifice, as they are attracted to the odor of gas. If the chase area or "doghouse" is not insulated and sealed correctly, cold air will conduct directly into your home. A fireplace mounted on cement versus plywood, can transfer cold into your home. What are the signs that my gas fireplace needs service? How often do I have to clean the fireplace vent? Gas fireplace service and maintenance will depend upon the use and type of installation. Most manufacturer warranties require a qualified service technician to perform an annual inspection and service. Why does my gas fireplace give off an odor while in use? Brand new fireplaces may produce an odor during the initial hours of burning as dust, paint and oils from the manufacturing process “cure.” Gas fireplaces that are not new may have a build-up of dust and debris; try cleaning behind the upper and lower louvers. Odor can also be present based on the type of unit. Vent-free gas fireplaces and logs may exhaust “off gases” into your home and can cause an unpleasant odor. Why does my gas appliance collect black soot? Soot build-up is a result of flame impingement caused by incomplete combustion. Simply put, flames come into contact with a surface, cool the flame, and prevent combustion. This can be caused by blocked burner tubes or improperly placed logs. Should you notice a build-up of soot, turn the unit off and call for an appointment. WARNING: Vent-free gas logs should never have soot build-up.